In addition to ongoing collaborative work with Redhawk Logistica, Luke Perry has developed a number of individual public artworks during his time in residence. Perry’s long family history of skilled industrial manufacture can be discerned in all of the work he makes. Perry’s primary research concern is not in the cars produced in Longbridge during the existence of the plant, but its working population – a community entirely dominated by the factory, that has the factory in its very being. One of Perry’s earliest LPAP projects was ‘Map’. ‘Map’ arose from interviews and conversations with ex-workers and with younger residents who have grown up with stories of the plant. It also came from a desire to visually map the enormous factory site. The result was an expanded and annotated drawing, made with the help of ex-factory worker and local resident John Baker, and Austin Sports & Social Club members. The map was exhibited at LPAP’s temporary space throughout 2014, and at approximately thirty-feet long, acted as an accessible stimulus for conversations and the recollection of personal memories. Attending the ‘Pride of Longbridge’ event further extended Perry’s intimate research into Longbridge’s living history. He made a series of colour photographs of residents holding slates inscribed with their reflections on how and why Longbridge is a source of pride. The series of portraits threw up surprising and touching stories about the significance of Longbridge – from a celebration of British manufacturing expertise to a man who met his future wife at the plant. The results are now significant records of emotional responses to place. These are important messages to remember when faced with huge loss, innumerable changes to the physical and social landscape, and what is, for many in Longbridge, an uncertain future. 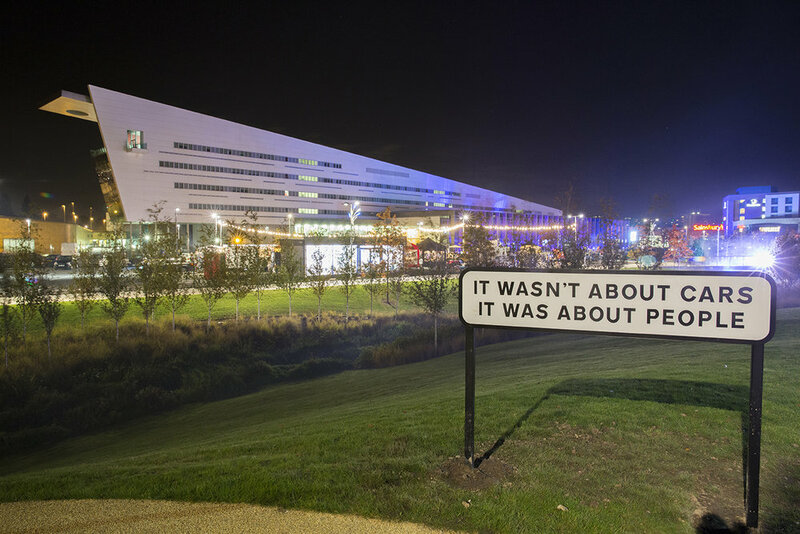 ‘Longbridge Street Signs’ was a commission from LPAP in which Perry developed and installed a series of steel road signs within the Longbridge area. The words on each sign are phrases taken from conversations with numerous former plant workers, again, like much of Perry’s public works, directly reflecting the thoughts, experiences and emotions of people from this particular place. One sign reads ‘I slept to the sound of the hammers’ – a particularly evocative statement about the audible and emotional reach of the plant. Perry’s series of fifteen signs are subjective and open to interpretation, acting as mediations on and interventions within the landscape. It is significant that Perry manufactures artworks himself, often using processes that have been used for multiple decades. This set of creative skills and knowledge connects his output directly to those of the Longbridge site. Perry’s working processes, as a maker of public artworks, consistently involve collaborations and discussions with communities. This supports opportunities for residents, such as those of Longbridge, to explore their own identities, in their own voices, while availing of the expertise of an artist in the creation of monuments to Longbridge’s varied legacies and to its future. Luke Perry is the director of IHS a company responsible for building one of the largest mining monuments in the world. He has re-made parts of the industrial landscape, created life sized communities in steel and created one of the country’s most iconic figurative sculptures. As well as monuments and landmarks IHS have become specialists in sculpture trails, working directly with the users of canals, town centres and nature reserves to create interpretation and sculpture.